IM Plus is a Mobile Chat Client which has Quite Impressive Features and is available for Wide Range of Mobile Platforms- iPhone, BlackBerry, Windows Mobile, Symbian S60, Android, Java Phones, Web OS and Others. Integrates Your Phone Contacts into The App. Enables Messaging via SMS within the Application. Integrates ICQ, MSN, Jabber, AOL, Yahoo!, Gtalk and MySpace.. User Interface is “Down to Earth”, Gives a Feel that you’ve not Installed any Third Party App. 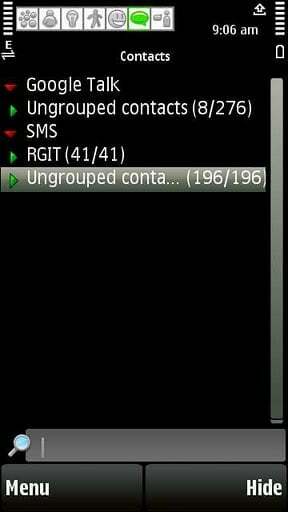 Well Organized Contacts Lists with Thumbnails arranged Next to Next ..
Switch Between Accounts in No Time, Migrating From One Chat Account to Other is Made Easy with a Bar at Top.. Pop Up Notification for Recent Chat Conversation along with a Bell Tone.. File Size is 1 Mb… Reasonable, when Compared to Nimbuzz and Fring.. This App is Most Targeted for US with Apps like MySpace,Jabber,AOL, ICQ which is less used in India..
IM+ is not free, but it’s wholla worth it. If you have an iPhone 4, you can leverage multitasking, you can run it on iPad, and you actually have nice extra features like browser inside the app and so on. You can even download the free ad-based version of IM+. The really good multiclient IM, on BlackBerry and Nokia as well.